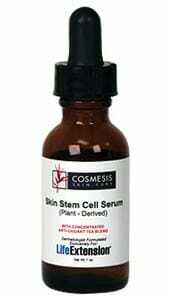 Cosmesis Skin Care helps improve the look of creased, thin, sagging (or loose), and discolored skin of the neck. It can also help lessen the appearance of prominent bands seen in the neck area and alleviate the dry, dehydrated veiny texture of the neck. 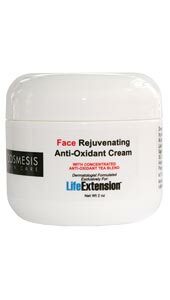 Replacing moisture lost to aging is a prime reason why people use face creams. Most commercial face creams are oil-based and work by blocking the release of water from the skin. As people grow older, however, they cannot rely on oil-based preparations to block the release of moisture. That is because aged skin loses the ability to attract moisture in the first place and fundamentally becomes dehydrated.13 At this point, aged skin needs to be replenished with its natural moisturizer complex in order to attract and retain water. 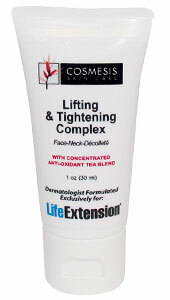 This cream is formulated with potent antioxidants, peptides, vitamins, tea extracts and powerful anti-aging ingredients. 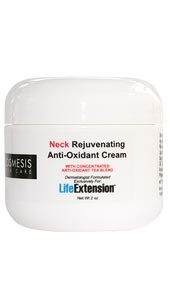 It helps improve the appearance of creased, thin, sagging (or loose) and discolored skin on the neck. It also helps improve the appearance of prominent bands around the neck area and the dry, dehydrated, veiny texture of the neck. Ingredients: Purified water, Acetyl Glucosamine, Acetyl Hexapeptide-3, Nicacinamide, Hyaluronic Acid, DMAE, Alpa Lipoic Acid, Cu Complex, L-Carnitine, Retinol, Grape Seed Oil, Orange Flower, Neroli, Chamomile Sage, Bergamont Tea, Co-Enzyme Q10, Vitamin E, Retinol, Grape Seed Oil, Concentrated Anti-Oxidant Tea Blend Extract, Emulsifying Wax N.F., Avocado Oil, Soybean Oil, Glycerin, Silicone (Dimethicone), Phenoxyethanol, Ethylhexyglycerin. Apply one or two times daily to the neck. 13. Br J Dermatol. 2008 Feb;158(2):251-60.